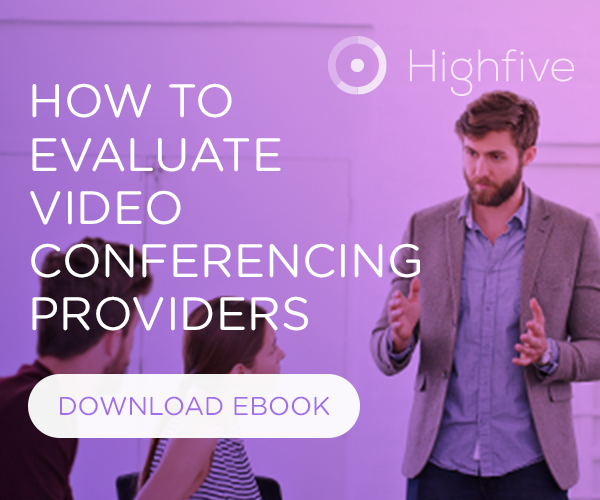 This article lists all requirements you'll need to use Highfive in your conference rooms. Highfive personal device requirements can be found here. 1080P display with an open HDMI port. Turn off all picture enhancement settings like overscan, etc; set sharpness, etc to 0. Turn off all sound sweeteners such as auto-volume leveling (also called auto gain control [AGC], AI sound), virtual 3D, surround sound, etc. For the Highfive device, the max room size for the best audio quality is 14'x22'. For a network connection, a DHCP-enabled Ethernet port is required. In rooms with stone or glass walls, hang textiles, wall art, or acoustic panels on parallel walls. In rooms with bare floors or high ceilings, add an area rug. In any acoustically challenging room, add a tall bookcase that holds various sized objects. Note: If you are using a Dolby conference phone with the Highfive device, check out the Dolby setup requirements here. Outbound UDP port 5005. Replies sent to a flow on port 5005 must be routed back to the Highfive client through any firewalls and NATs. As with any real-time web conferencing system, Highfive attempts to compensate and adapt to network conditions and glitches. However, you can help ensure best results by being aware of what can help the most. Video and audio are sensitive to 4 fundamental metrics of network health: available bandwidth, packet loss, latency, and jitter. Bandwidth: at least 2.5 Mbps (uplink) and 4.5 Mbps (downlink) available to each device that will be connecting to a meeting. Mobile devices require 1Mbps up/down per endpoint (2Mbps up/down recommended). Latency: less than 70 ms one-way latency to the Highfive service (e.g. start.highfive.com), with a standard deviation less than 30 ms.
Jitter: less than 80 ms.
Video quality will suffer if these conditions are not met. You may see frozen video, low framerate, lower image quality, or higher "lag" especially with respect to the accompanying audio. Note: For networks that are more customized, the network optimization steps outlined in this article can be performed to ensure the best experience possible.